Create VIP event styling with chrome posts & 3 rope colour options. Hire retractable queue management barriers in chrome or black in quantity. Ideal for conferences, presentations & even school concerts! 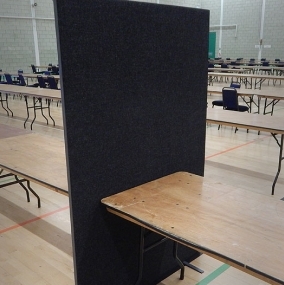 Offer privacy or separate areas within your event arena with screen hire. Achieve fantastic event styling with balustrade, available to hire in quantity. If you are holding either an indoor or outdoor hire event which needs barriers or staging, then Event Hire UK will be able to meet your requirements. The objective of most events will be to attract large volumes of people, at which point you need to ensure that you are managing these people in a safe and efficient manner. 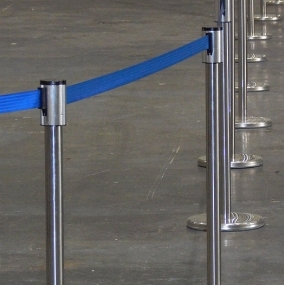 This can be achieved through using barriers such as tensabarrier hire which are black posts with retractable webbing approximately two metres long – perfect for queue management at events and venues such as airports, shops and for those Black Friday shopping queues! At the same time, Event Hire UK also offers chrome rope and post for hire which are most orientated towards giving your event a VIP look. These are the ‘barriers’ that you might find outside a nightclub or at the entrance to an award ceremony or society ball event. 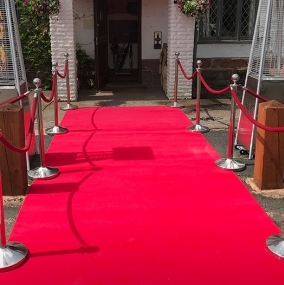 They give a real red carpet feel, making your guests feel very welcome and important when they arrive. Event Hire UK also offers office screen for hire which are actually more versatile than you might first imagine. Yes, they can be used in offices to separate desks and working area, providing an open plan office with a small degree of privacy. By the same token, however, we find that the hire of office screens is also popular around local and national election time where people go into temporary ‘booths’ to cast their vote. A democratic society requires that a person can cast their vote in private and so temporary office screen hire is a must! 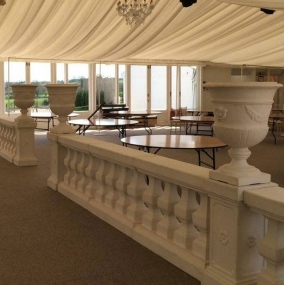 As well as posts and ropes and tensabarrier hire, we also offer balustrade and urns which looks fantastic at countryside marquee wedding events, helping to define the areas both inside and outside where your guests can socialise. 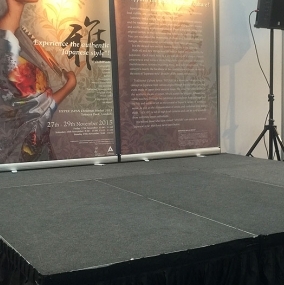 Furthermore, our range of portable stage hire units is popular for events such as fashion shows and similar occasions where people need to be raised up in front of an audience. Event Hire UK offers a fast, efficient and reliable service by our specialist logistics team in your area. We have large quantities of barriers for hire of all different colours and so we are sure to be able to fit your needs, whatever your event. Why not give Event Hire UK a call and find out just why both professional and private event organisers across the UK put their faith in us to provide the kind of service level they expect and rightly demand. From our nationwide network of sales and distribution centres, we are able to service most events in the majority of locations when it comes to tensabarrier hire, VIP posts and ropes and other event equipment hire, so don't hesitate to get in contact.